My wedding was on August 3-4, 2018 and Amplifier Entertainment was recommended to me by my wedding planners and I am so happy that I went with them! From the start, they were very responsive with emailing/phone calls to help me pick the package that was best for my event. Ultimately, I picked the package that covered the garba/sangeet, the baraat, and the wedding/reception- so these guys were there for the entire wedding! They were very professional, timely, and delivered their services perfectly. We did not have to worry about a single detail because they had everything figured out and they worked with my planners super well. 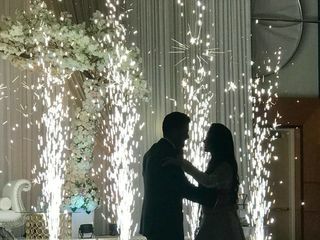 They also had great equipment, including a fog/cloud machine, indoor fireworks, and a gorgeous white LED starlit floor that really set my wedding apart and wow-ed the guests! Some of my guests told me they have never seen any of these additions to a wedding and were beyond impressed. One thing I really appreciated about this company is that when my planners and I were trying to figure out how to get a huge mirror photobooth to the wedding, they agreed to haul it over in their truck along with their equipment! I highly recommend Amplifier Entertainment and was lucky to have them at my wedding! Amplifire Entertainment did an extraordinary job with our Garba, Wedding, and Reception. Everything from the MC, coordination, to audio/visuals and pyrotechnics was executed perfectly. We would especially like to praise their professionalism and communication; Arjun, Jimmy, Parth, and the rest of the team were not only available to answer our questions and attend to our requests, but they were very flexible when it came to putting on the event that WE wanted. 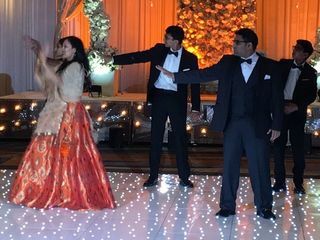 The party seemed like it didn't stop from the moment the baraat started in the morning with a dhol player and van blaring music for our guests, all the way into the evening where the reception was jam packed. 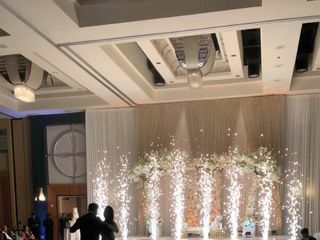 Beyond the basic necessities of a wedding & reception, the Amplifire team did a phenomenal job executing the fog machine, sparklers, and bringing extra hype to the event with the CO2 gun (highly recommended!!). We've already had many of our guests inquire about using their services for their own events and we highly recommend that you go with Amplifire Entertainment for your next event! We used Amplifire Entertainment for our Garba, Wedding, and Reception. They did a phenomenal job DJing, MCing, and coordinating additional related services (i.e. starlight dance floor, CO2 smoke guns, ballroom uplighting, dhol player, pyrotechnics, and the dry ice fog). From our initial conversation to the day of, they were very professional, organized, and understanding. They took the time out to meet with us multiple times to help plan each and every detail.. During the events,I am not exaggerating when I say THEY WERE PERFECTION. Not only did they execute as we planned, but they went beyond our expectations. The dance floor was packed during the entire reception! Many of our guests inquired about them as they were so impressed with their flawless execution. We were extremely satisfied with the Amplifire Entertainment. group and highly recommend them! Arjun, Drew and their team at AmpliFire entertainment were one of the best things about our wedding! We hired them for our sangeet night and wedding day. Their energy is unmatched- from the baarat to the reception, Arjun as the MC had everyone on their feet the whole night and really had all of the guests excited throughout the day. Drew and his team did an awesome job DJing and really listened to our requests for the style of music we wanted. They helped to keep things organized as we had several performances for the sangeet night, and helped coordinate the garba portion of it as well. 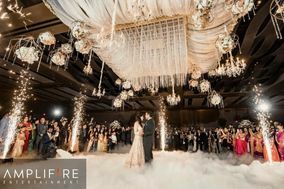 We used the dry ice fog and indoor pyrotechnics and they really made our entrance and first dance unforgettable. We can't thank AmpliFire enough for their professionalism and hard work to make our event so special. Highly recommend them! I would like to give a huge thanks to the entire team of Amplifer Entertainment in making my reception party an event to remember for a life time! Drew, Arjun, And Jimmy did an absolute phenomenal job both MC'ing and DJ'ing throughout the night. Their sense of professionalism and experience were evident consistently. The DJ listened to our requests and put together a killer playlist that had the crowd pumped. Additionally, the team genuinely cared about the subtle details and showed that they wanted to make our experience unique for my family and friends. In fact, we personally received countless compliments on the music and the event overall. I would no doubt recommend Amplifer Entertainment for those looking to make their event memorable! Thank You Guys! We are so glad we were able to have the cold fireworks and fog at our wedding reception! Our guests were so surprised and it completely stole the show! It looks amazing in our pictures and was a great way to surprise our guests. Arjun was easy to talk to and reach and knew exactly what we needed and gave us a great price! We highly recommend them to anyone and everyone! From the beginning Amplifire put us at ease regarding our DJ needs but our expectations were far surpassed making our wedding one of the best ever. From when I first met the team to later meetings - I could tell they were focused on delivering the best product possible. They had many extras available including lighting, step and repeat banner, starlight dance floor, cold sparklers and a CO2 gun. 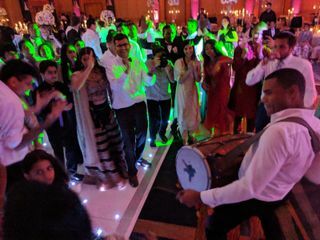 Their music selection was excellent as we had many people dancing at both our garba and reception that don’t normally dance which is a big win in my book. They read the audience well and keyed into the music that kept people moving - it is their passion. We had a fusion wedding and the team keyed into the unique challenges of a fusion wedding and ensured pronunciations and event timing was perfect. They never missed a cue and have received comments well after the wedding regarding the excellence of the DJ’s. I also don’t write many reviews but can’t help but to share my experience with everyone. I would be glad to book them again for my younger brother’s wedding without hesitation - the day we set a date is the day we call Amplifire to DJ our next wedding. After interviewing 15 DJ'sWe hired AMPLIFIRE ENT. for our sons first and fifth birthday event, I can say nothing but good things about them. Arjun was very accommodative to last minute changes we made to our itinerary. they played well throughout the party keeping the boredom away from our event. the best part was when the MC announced entrances for our event it was just like Music shows and TV. I can't wait to hire them again for my daughter's sweet 16 IA. Best DJ ever! Thank You Arjun and team for amazing service! Ever since I inquired with Amplifire Entertainment for a DJ for my wedding, they had by far exceeded my expectations! I had no idea on how many different services a DJ could possibly have and believe me, I went with a majority of them and couldn’t have been happier on my special day. They not only provided their services but helped with other vendors, such as decorations and photographers to make sure everything went well. They kept in touch with me often and made sure that each and every moment was nothing short of phenomenal! MC Arjun was so helpful and his hospitality was like no other. The team is filled with talent and DJ Drew rocked out the packed dance floor for 3 hours straight and stayed after hours for those who wanted to keep partying on! My husband and I will ALWAYS go to this team for any DJ services because of their great pricing, services, and attitude to their business. I’d like to thank these guys one more time (I honestly can’t thank them enough), for not only blowing my expectations for the night but making sure that I was never worried a step of the way. The team is a solid 5/5 and will not let you down. Ever since I first made initial contact with AmpliFIRE Entertainment, DJ Drew was in constant communication with us. There was never one question he left unanswered and we were so confident in hiring him for our special day. He helped coordinate the event, helped us pick other vendors, and even worked with us for developing and making a very clear cut itinerary for the day. 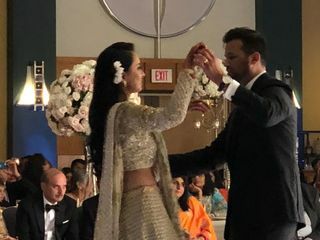 On the day of the event, Drew completely ROCKED my morning Baraat and kept everyone dancing including all the grandparents who are in there late 80's. Throughout the rest of the day he worked very closely with the Hanover Marriott staff and caterers to make sure that they were all in sync with one another and the entire event went smoothly from cocktail hour till the dance floor. LETS not forget, the music at my wedding was by far the best. There was a non stop dance floor for more than four hours and he even stayed an two hours overtime because no one was leaving the dance floor. From my experience, I would hire these guys they will blow your wedding day event. Thanks for making my wedding day one for the books Drew. I will reach out to you guys for all my future events! The DJ was amazing. Definitely makes or breaks a party and he made it. My family consists of huge music heads so our standards were high, but were definitely exceeded. They were great with requests and reading the vibe of the crowd which is super important. Although I wasn't there for set up, I know they arrived on time and had no issues or lack of equipment. All in all the value was great and I could not have asked for much more. Very happy I booked with Amplifire and would strongly recommend others to do so. We worked with Arjun and his team for our wedding on June 25th 2017 (Dhol and Mobile Baarat Van) at the Imperia. We also hired AmpliFIRE for our Sangeet night the day before; there was no reception. The whole experience was amazing! Arjun was professional, courteous, and responsive. I should add that he's very down to earth as well so it was very easy to work with him when we had to make a bunch of last minute changes. 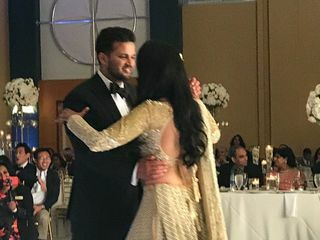 He worked with us on which music we would like to play on both days to having an itinerary, and going as far as going over the names so he was pronouncing them correctly during the Sangeet. He even stayed a little bit over since we were running late with some events, but did not charge. Extremely great team to work with. I plan multiple events every year for the various organizations I am a part of and so far AmpliFIRE Entertainment is by far the best company I have hired. They 100% cater to any DJ or lighting needs and are flexible enough to work around your needs and budgets.I fully Recommend them. The crew at AmpliFIRE could not have done a better job with my father's birthday party. From the lighting that was provided to the large TV's as well as the great music, they exceeded all of our expectations and then some. I would without a doubt recommend them to any of my friends regardless of the occasion. DJ Drew did a fantastic job. I will hire him again in a heart beat. The Amplifire team was an absolute pleasure to work with from the beginning! When I was in the market research stages of finding vendors, they were easy to talk to and waited patiently for me to make my final decision. They were great about providing suggestions for cool wedding ideas! I was a pretty neurotic bride, but they put up with all my shenanigans, all with a smile on their face! I remember seeing all my loved ones on the dance floor on our wedding day, and that was all thanks to this team! People really enjoyed the music and the MC'ing! They provide a lot of services that can help make your reception a little different from everyone else's. I would not hesitate working with them again and have already recommended them to my friends who are engaged/getting married! Great team! Everyone was extremely professional and courteous. They helped us work out a last minute kink with the venue as well. They did a great job and kept the music going well into the night. Would highly recommend these guys for your next event! Arjun and his team had the dance floor rocking during the sangeet night. Was very quick to adapt to the last min change we had in our itinerary. People were dancing non-stop to his tunes and collection. Several people told me after the event that the DJ rocked the event. Definitely recommended.